Third Row Seat, Heated Seats, iPod/MP3 Input, CD Player, Power Fourth Passenger Door, DRIVER CONVENIENCE GROUP, TRANSMISSION: 6-SPEED AUTOMATIC 62TE. Granite Pearl Coat exterior, SXT trim. EPA 25 MPG Hwy/17 MPG City! CLICK ME! KEY FEATURES INCLUDE Third Row Seat, Quad Bucket Seats, Power Liftgate, Back-Up Camera, iPod/MP3 Input, CD Player, Power Fourth Passenger Door. Rear Spoiler, MP3 Player, Privacy Glass, Keyless Entry. OPTION PACKAGES DRIVER CONVENIENCE GROUP Overhead Storage Bins, Cupholders w/Overhead Illumination, Single Rear Overhead Console System, Sun Visors w/Illuminated Vanity Mirrors, Heated Steering Wheel, Overhead Ambient Surround Lighting, Left 2nd Row Window Shades, Right 2nd Row Window Shades, Illuminated Front Door Storage, Heated Front Seats, Universal Garage Door Opener, Rear Swiveling Reading/Courtesy Lamps, 3 Zone Auto Control Front/Rear A/C, BLACKTOP PACKAGE Leather Wrapped Shift Knob, Black Interior Accents, Silver Accent Stitching, Black Headlamp Bezels, Front Fog Lamps, Delete Roof Rack, Wheels: 17 x 6.5 Aluminum, Rear Fascia Scuff Pad, Leather Wrapped Steering Wheel, ENGINE: 3.6L V6 24V VVT (FFV) (STD), TRANSMISSION: 6-SPEED AUTOMATIC 62TE (STD), QUICK ORDER PACKAGE 29P Engine: 3.6L V6 24V VVT (FFV), Transmission: 6-Speed Automatic 62TE, Black Finish I/P Bezel MORE ABOUT US The staff at Mount Airy Chrysler Jeep Dodge is ready to help you purchase a new or used car in Mt Airy. When you visit our car dealership, expect the superior customer service that you deserve. With years of experience and training, our team will get you into the car, truck, or SUV that was built for you. Get the new or used car by Jeep, Dodge, Chrysler or RAM in Mt Airy that you have been dreaming of by calling or visiting our dealership today. Fuel economy calculations based on original manufacturer data for trim engine configuration. Please confirm the accuracy of the included equipment by calling us prior to purchase. 3rd Row Seat, Heated Seats, iPod/MP3 Input, CD Player, Power Fourth Passenger Door, DRIVER CONVENIENCE GROUP, QUICK ORDER PACKAGE 29P. Black Onyx Crystal Pearl Coat exterior, SXT trim. FUEL EFFICIENT 25 MPG Hwy/17 MPG City! AND MORE! KEY FEATURES INCLUDE Third Row Seat, Quad Bucket Seats, Power Liftgate, Back-Up Camera, iPod/MP3 Input, CD Player, Power Fourth Passenger Door Rear Spoiler, MP3 Player, Privacy Glass, Keyless Entry. OPTION PACKAGES DRIVER CONVENIENCE GROUP Overhead Storage Bins, Cupholders w/Overhead Illumination, Single Rear Overhead Console System, Sun Visors w/Illuminated Vanity Mirrors, Heated Steering Wheel, Overhead Ambient Surround Lighting, Left 2nd Row Window Shades, Right 2nd Row Window Shades, Illuminated Front Door Storage, Heated Front Seats, Universal Garage Door Opener, Rear Swiveling Reading/Courtesy Lamps, 3 Zone Auto Control Front/Rear A/C, BLACKTOP PACKAGE Leather Wrapped Shift Knob, Black Interior Accents, Silver Accent Stitching, Black Headlamp Bezels, Front Fog Lamps, Delete Roof Rack, Wheels: 17 x 6.5 Aluminum, Rear Fascia Scuff Pad, Leather Wrapped Steering Wheel, ENGINE: 3.6L V6 24V VVT (FFV) (STD), TRANSMISSION: 6-SPEED AUTOMATIC 62TE (STD), QUICK ORDER PACKAGE 29P Engine: 3.6L V6 24V VVT (FFV), Transmission: 6-Speed Automatic 62TE, Black Finish I/P Bezel WHO WE ARE The staff at Mount Airy Chrysler Jeep Dodge is ready to help you purchase a new or used car in Mt Airy. When you visit our car dealership, expect the superior customer service that you deserve. With years of experience and training, our team will get you into the car, truck, or SUV that was built for you. Get the new or used car by Jeep, Dodge, Chrysler or RAM in Mt Airy that you have been dreaming of by calling or visiting our dealership today. Fuel economy calculations based on original manufacturer data for trim engine configuration. Please confirm the accuracy of the included equipment by calling us prior to purchase. 3rd Row Seat, Heated Seats, iPod/MP3 Input, CD Player, Power Fourth Passenger Door, Back-Up Camera, DRIVER CONVENIENCE GROUP, BLACKTOP PACKAGE. SXT trim, Octane Red Pearl Coat exterior. EPA 25 MPG Hwy/17 MPG City! AND MORE! KEY FEATURES INCLUDE Third Row Seat, Quad Bucket Seats, Power Liftgate, Back-Up Camera, iPod/MP3 Input, CD Player, Power Fourth Passenger Door Rear Spoiler, MP3 Player, Privacy Glass, Keyless Entry. OPTION PACKAGES DRIVER CONVENIENCE GROUP Overhead Storage Bins, Cupholders w/Overhead Illumination, Single Rear Overhead Console System, Sun Visors w/Illuminated Vanity Mirrors, Heated Steering Wheel, Overhead Ambient Surround Lighting, Left 2nd Row Window Shades, Right 2nd Row Window Shades, Illuminated Front Door Storage, Heated Front Seats, Universal Garage Door Opener, Rear Swiveling Reading/Courtesy Lamps, 3 Zone Auto Control Front/Rear A/C, BLACKTOP PACKAGE Leather Wrapped Shift Knob, Black Interior Accents, Silver Accent Stitching, Black Headlamp Bezels, Front Fog Lamps, Delete Roof Rack, Wheels: 17 x 6.5 Aluminum, Rear Fascia Scuff Pad, Leather Wrapped Steering Wheel, ENGINE: 3.6L V6 24V VVT (FFV) (STD), TRANSMISSION: 6-SPEED AUTOMATIC 62TE (STD), QUICK ORDER PACKAGE 29P Engine: 3.6L V6 24V VVT (FFV), Transmission: 6-Speed Automatic 62TE, Black Finish I/P Bezel VISIT US TODAY The staff at Mount Airy Chrysler Jeep Dodge is ready to help you purchase a new or used car in Mt Airy. When you visit our car dealership, expect the superior customer service that you deserve. With years of experience and training, our team will get you into the car, truck, or SUV that was built for you. 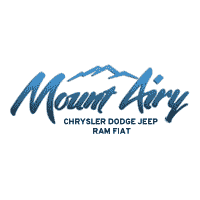 Get the new or used car by Jeep, Dodge, Chrysler or RAM in Mt Airy that you have been dreaming of by calling or visiting our dealership today. Fuel economy calculations based on original manufacturer data for trim engine configuration. Please confirm the accuracy of the included equipment by calling us prior to purchase.